Whip up a batch of our delicious Scotch pancakes, then given them a fruity makeover. 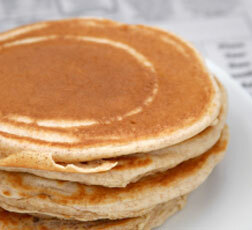 Great as a tea time treat, and for something different on Pancake Day. Brush or spray a medium heavy-based, non-stick frying pan with oil and set over a medium heat. Pour a small amount of the mixture into the pan and swirl around to coat the base – you want a thin layer. Cook for a few mins until golden brown on the bottom, or until small bubbles appear on the pancakes surface, then turn over and cook until golden on the the other side. Repeat until you have used all the mixture, stirring the mixture between pancakes and brushing the pan with more oil as necessary. Top pancakes with extra berries and yoghurt, if using to serve.